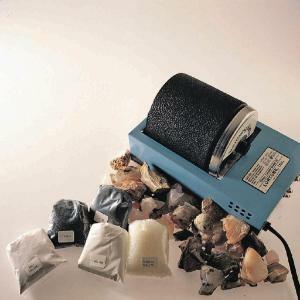 There’s no better way to introduce your students to a classic lapidary process than with this economical tumbler kit. Show the emerging beauty of seemingly “ordinary” rocks and minerals, while helping your students more clearly discern their unique physical properties. The tumbler’s quiet, all-rubber barrel makes rock-polishing as pleasing to the ear as it is to the eye. It comes with assorted rough gemstones, premeasured abrasives, polish, and instructions. 110 VAC with a 6' cord.